Akkara Adisil also known as ‘Akkara Vadisal’ is one of the famous Traditional dish . 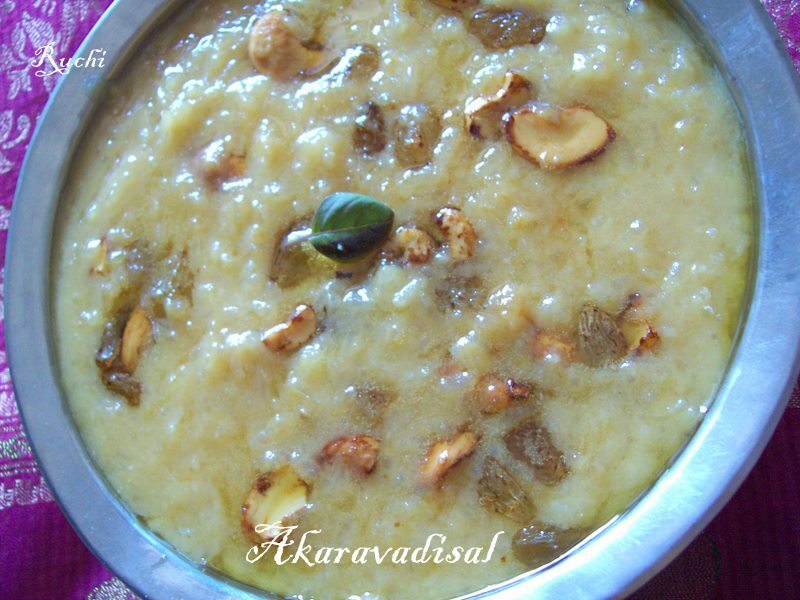 Akkara Adisil is usually prepared on the "Koodaravalli day" which comes on 27th day of the Margazhi month and offered to the lord. In the 27th poem "Koodaraivellum" of "Tiruppavai" Sri Andal says "Mooda nei peidhu muzhangai vazhivaara"and so we prepare the akkara adisil with lot of ghee & "Koodi irundu kulirndhaelo" meaning share and enjoy the food with everyone present. The akkaravadisal given in temples as prasadam has its own unique taste. Today I prepared Akkara Vadisal’ as Neividhyam. 1.Rinse the rice and clean it and add fried moong dal In a heavy bottomed pan, and and 4 cups of milk and pressure cook it. Leave atleast 4 to 5whistles so that the rice is smashed well. 2.In another stove place the jaggery in a vessel and add little water say, less than 1/4 cup. Bring it to a boil and let the jaggery dissolve completely. 3.Add the filtered jaggery water and the remaining milk to the cooked rice and add some ghee and cook over medium flame stirring it to avoid burning. 5.In a separate pan, add ghee and add broken cashew nuts, dried grapes and fry it till it turns golden brown color.Hot Akkaravadisal is ready for neivedhyam . It tends to thicken with time, hence you can add some warm milk to loosen it up a bit according to the consistency you like. You can add a tsp of ghee before serving. Wish to have some rite now Akka,super tempting akaravadisal.